The daughter of the former vice president of the Philippines reacted on the recent declaration for the administration standard bearer Mar Roxas. 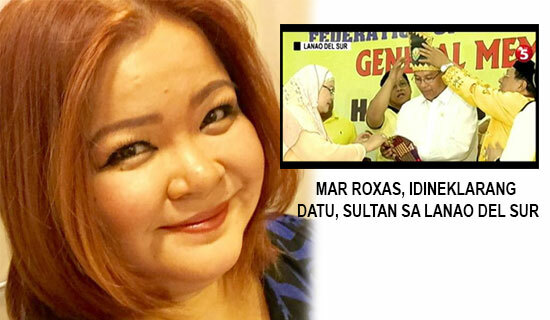 DILG secretary Mar Roxas was declared as "Datu" or "Sultan" in Lanao Del Sur. According to news, after the Interior secretary Mar Roxas visited the Marawi City on Tuesday, January 12, 2016, he was granted an honorary Sultan or adopted son of Lanao Del Sur. Kat De Castro expressed her thoughts and took her facebook account to say this message, "I know to be declared as sultan, one should have royal blood. I am a part of the royal Sinsuat clan. I know these things." Then asking her followers and friends, "Who in the world is Mar's adviser?! This won't paint a pretty picture at all." She even gives some comments regarding to her post on facebook, she said, "Sabihin man nating honorary, it is actually a bit of an insult to Muslim history and tradition. Haaay. We should protect the Muslim culture. Hindi." "It was a non profit org daw who declared him as adopted son/Sultan of LDS. So, okay. Wasn't aware that it's possible na pala," Kat De Castro added. Kat also took her micro-blogging site account to post his thoughts about the issue. She also advised Mar to fired his adviser because of the wrong strategy given to him. I read somewhere that Mar was declared a Datu or Sultan in Lanao Del Sur. I am not aware that you can now be a Sultan w/o royal blood. Mar should fire his adviser. These tactics isn't helping him at all. Just a thought. Comments or suggestions about "Former vice president daughter reacted to Mar Roxas as 'Datu or Sultan'" is important to us, you may share it by using the comment box below.